It helps to know which roof can protect your home from severe weather conditions for many years. That said, it can be tough choosing a roof, along with a unique profile, that will match your home’s architectural style. Fortunately, you can count on trustworthy roofing companies in Michigan, like Kroll Construction, to help you choose the best roof to complement your home’s exterior features. 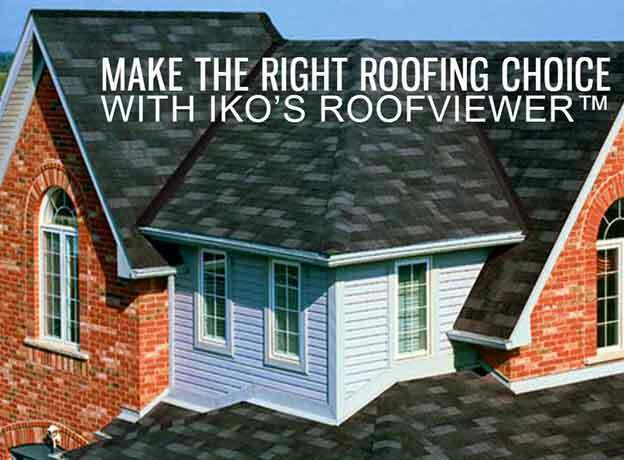 As an authorized dealer of IKO’s roofing products, we highly recommend the use of their convenient ROOFViewer™. Let us show you how this can help you realize the ideal roofing design for your home. You have the option to start designing your home’s exterior by using pre-uploaded homes. You also have the choice to upload your own home image to serve as an example. If you already have an existing account with IKO’s ROOFViewer, then simply fill out the required information to log in to your account. This will let you continue any saved progress you had prior. Otherwise, you can start using this convenient tool by creating your personal account. You can also just proceed without creating an account. Start designing your roofing in Michigan by choosing the Select New House tab. This will bring you to a page that will let you choose from different pre-uploaded home styles as a dummy home for your design ideas. Once you select a particular home style, you will be directed to a bigger image of your chosen house structure. Note that you can hover on different parts of the house such as its roofing, siding, or trim. Clicking on them will provide you with a window at the bottom showing you an array of colors and profiles you can apply on the home style. This will give you an idea on how your selected roofing will look on the specific home style of your choice. You can also zoom in and out of the image, undo, or redo, your actions. Furthermore, you can save your progress and even email or print it if needed. Lastly, the help tab located at the side of the page along with the other options will provide you with basic instructions on using and navigating the page. This lets you compare your design to the original appearance of your chosen home style. You can redo everything by just clicking on “revert to original” tab. When you feel that you are all set, you can now upload your finished design through IKO’s FREE ImageMapper. Just click to the corresponding link and you will be guided through the process of mapping your image for use on the IKO ROOFViewer. As IKO-certified roofing contractors in Michigan, you can also rely on us to help you realize your dream home with our roofing options and knowledge. We have years of experience working in the industry and this will help us select the best roof for your home that will surely enhance its aesthetic appeal. Call us today at (888) 338-6340 for a FREE roof inspection and estimate.